A warm welcome to Anglia Sunshine Nurseries on behalf of our team. We look forward to meeting you and welcoming your family to the sunshine experience. Anglia Sunshine Nurseries is conveniently situated on the outskirts of Sudbury, Suffolk, offering easy access and parking for parents. As a working mother myself, when I started the Nursery in September 2003, it was with the view to offering the best facilities and environment possible to give busy parents peace of mind. The extensive under cover outdoor play area and garden lends itself beautifully for all weather outdoor activities and enhances the range of opportunities that we offer. Ensuring that the children have healthy and interesting food, we have our own qualified in-house chef who freshly prepares well-balanced meals. Knowing the challenges of getting out of the door with the children in the morning with all their paraphernalia, we provide all snacks, drinks and meals and have a good stock of clothes, just in case, to help relieve the stress. The majority of our team are fully qualified and in total have over 84 years of child caring experience between them. We have stringent criteria for any new Nursery Nurses joining our team as attitude, patience and creativity are all of paramount importance to maintaining the environment we have created. We look forward to sharing our Sunshine experience with you. 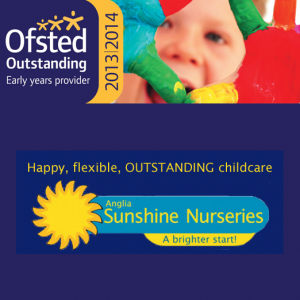 Anglia Sunshine Nurseries offers funding in accordance with Suffolk County Council’s guidance, for children from the term following their 3rd birthday. We also offer 2-year-old funding if your child is eligible and in receipt of a golden ticket.